Well, at least her supplies won't be that expensive with only 3 kids in class this year. But, if you're like the average American teacher, you have anywhere from 21-27 students in your class, and at my school, 32 is not uncommon. Larger class sizes obviously mean more of your money is spent on supplies and more time is spent grading. 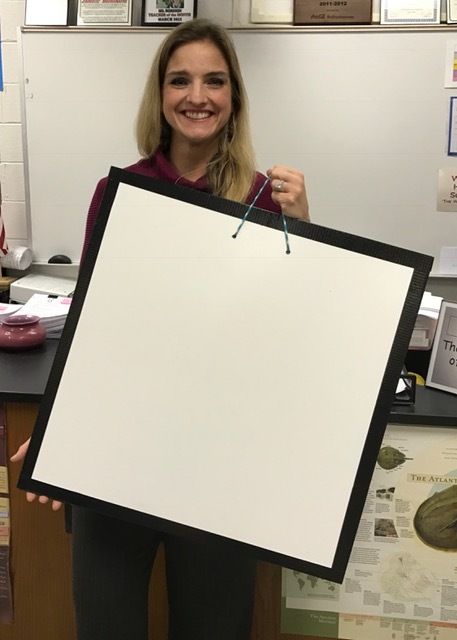 In my blog post Teachers, Stop Grading Everything, I wrote about how I used whiteboarding to reduce my grading load, and I received some questions about how I had acquired a class set of the group-sized boards without selling a kidney. This week I teamed up with a math teacher from my school, Melinda, who found the cheapest boards for purchase were $24.99- needing 32 boards meant roughly $800 or two kidneys. Yikes! Instead, we made them: Home Depot* to the rescue! In case you don't spend much time at home improvement stores, the "thrifty" dry erase panels are near the lumber, and this was the item we chose. Each piece makes 8, 2'x2' boards, so we picked up 4 of them. The store will cut them for free. Be careful as you pick them up, the edges get damaged easily until you tape them. And, that's why you need one roll of black duct tape. Don't be tempted by the pretty designs and colors they have available: your black Expo markers will stain them and leave a dark residue. This item is essential to keep the corners of your "thrifty" board for getting bent. After two years, mine are still unscathed. You can find tape in the middle of the store near the paint department. With two quick drill holes at the top of the board, the rope handle makes the boards easier to maneuver when the students are presenting and can be used to hang them for storage. The time to tape the edges and drill the holes was minimal, and I had students help tie to handles during study hall. Child labor, FTW. Note: I use microfiber clothes for the students to clean the boards that are machine-washable and more economical and effective than traditional erasers. I maintenance them with Fantastic and Pledge to keep the finish looking nice, as well. If you have not tried furniture polish on your white boards, you should; they erase so much easier! Lastly, once that you have new boards for the kids, feel free to keep the new Expos for yourself. I am fairly certain the wrinkles that have started to creep up on my forehead are from furrowing my brow and forming this same exact expression while grading over the course of the last decade. After writing my first two blogs on going home earlier and leaving work at school, I thought I better share some strategies I have used get my papers graded during contract hours successfully. We teachers are tired of hearing commands from others without having solid, doable actions to marry with them. I am not a politician, so I will spare you that sort of treatment. "When students receive both scores and comments, the first thing they look at is their score, and the second thing they look at is...someone else's score. Being compared with others triggers a concern for preserving well-being at the expense of growth"
Who needs to really learn anything as long as you get an "A," especially if your "A" is higher than your neighbor's grade, right? Before I give you some grading tips, I think it's important to emphasize that grading everything students complete undermines intrinsic motivation, squelches curiosity and keeps students from taking risks due to concerns about performance*. But, I can also tell you that high school juniors are pretty smart: if they discover you aren't grading something, you have the same odds of winning the PowerBall as getting all of your class to do that assignment. So how can you get your class to interact with content, each other, and complete their work without spending all the productive years of your life with a red pen clutched in your hand? Well, I made a video for all you visual learners! Yay differentiation. Check it out. 1. Use whiteboarding and informal presentations to check for understanding, address misconceptions, encourage collaboration and get the students to DO their work. I am fairly certain that Expo markers have some "black" magic in their fumes that makes this happen. *chuckles* The American Modeling Teachers Association has excellent workshops and curriculum for STEM that integrate this practice if you want to know more. 2. For practice problems, have group secretaries share out answers on the board at the front of the room. Also, perform regular notebook checks that involve a few samples of work that is randomly selected. It only takes an occasional radar-wielding police officer at your local speed trap to keep your foot off the gas pedal. This isn't a rosy analogy, but in a culture where parents and administrators want grades but you want anxiety-free practice in your classroom, this is a quick and effective way to make it happen. 3. For free-response questions, grade in "chunks." Do so by getting a manageable portion of the answer key in your head, and then grading all your students' work for number 1 and 2, for example. Then do the same for numbers 3 and 4. This will keep you focused and your grading fair, and you will likely find your scoring becomes more consistent. It will also help you notice patterns in student misconceptions so you can address them more effectively. 4. Use a document pre-filled with common feedback to cut and paste comments into electronic work or have a poster made for your classroom that has common feedback abbreviations to cut down on the amount of writing needed to provide quality comments. Use a consistent rubric or checklist that can be quickly filled in as you read. I would love to hear your personal tips, and I hope this post "made the grade" for you. *I think that Mark Barnes does a nice job driving these points home in his article, "7 Reasons Teachers Should Stop Grading Their Students Forever." I also think that if I stopped grading students forever, I might lose my job.